How beautiful is this? 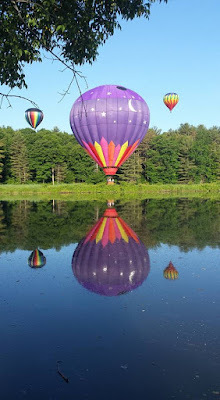 Last weekend I attended a hot-air balloon festival in Quechee, Vermont. 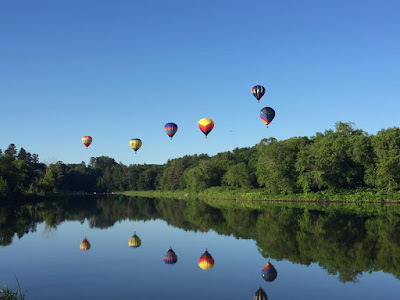 The weather was perfect, and the balloons were able to go up at all five scheduled times. Quechee is located in a scenic, rural area of the Green Mountains of Vermont, so the views are very nice. My daughter got this shot of two balloons appearing to knock together. The fairground is small but the operators are very careful. There's a small lake adjacent to the taking off spot, as well as a river, so there is plenty of opportunity for beautiful reflections. 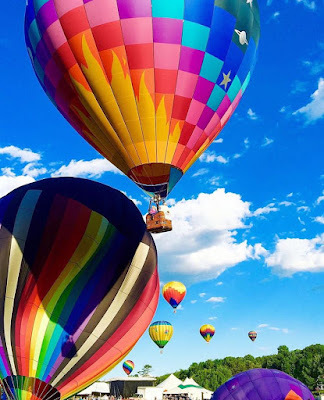 Has anyone here every gone for a ride in a hot air balloon?